What does every nonprofit need more of (especially smaller ones)? Unfortunately, I've seen nonprofit employees take on multiple roles and work overtime to make up for the lack of these resources at their organization. If this is what you're doing, it will always be a losing battle since the world is changing quickly and the demands for information and engagement are increasing. Fortunately there is a solution — lots of solutions. Every day new software solutions emerge that are designed for nonprofit time and money saving. By implementing the best nonprofit software tools at your organization, you can cut the multitasking and overtime. Wild Apricot is the number one provider of membership management software, used by over 3,833 nonprofits. If you’d like to give Wild Apricot a try, start a free, 30-day trial now. While Wild Apricot is just one software solution for nonprofits. There are many more designed nearly any task you can think of, like updating your social media accounts, analyzing your website visitors, and sending tasks to your volunteers. To help you find the best nonprofit software for your organization, I’ve put together this list of 49 of the latest and greatest nonprofit software solutions. 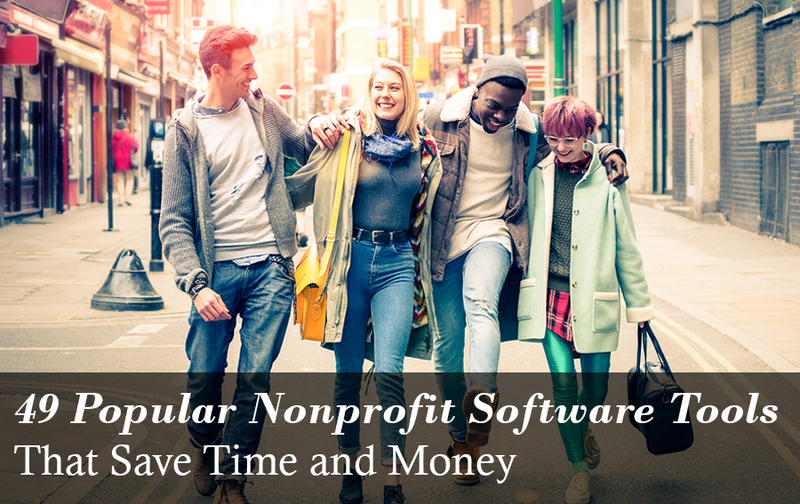 Many of these tools are available for free, or reduced rates to 501(c)(3) nonprofits, plus many of them have free trials to let you give the software a test drive before you purchase it. While this list may seem overwhelming, remember: you do not need to use every one of these tools all at once or at the same time. My advice is to focus on where you think time is being wasted at your organization and then test out a tool or two that might make things more efficient. Crazy Egg uses heat maps on your pages to show where website visitors are interacting with your webpages — where they scroll, where they click, and where people are coming from. Because of the detail of Google Analytics, Dashboard Junkie is a plugin that simplifies your Google Analytics reports to help you understand them better. Facebook Pixels are short snippet of code that can be inserted into your website. Back on Facebook, you can use those pixels to connect your Facebook advertising campaigns with people who have already visited your website, so you can assess things like conversion rates. One of the most powerful tech tools on the web, Google Analytics allows you to funnel, track events, track demographic, and much more. Inspectlet offers a full analytics suite that includes high-fidelity session recordings, a trio of heatmaps, traffic analytics, trends analytics, form analytics, and real-time notifications which allow you to get alerts based on custom events. Google’s can secure your nonprofit with up to $10,000 a month in in-kind ads. Their program is perfect for promoting your campaign, events, fundraising campaigns, or membership. If you need help knowing what to do with your grant, here are four ways to use a Google Ad Grant to drive meaningful results for your organization. Google’s Keyword Planner is a helpful tool that can assist you with researching keywords in order to see how people are finding you online, new ways to pull people in using high-traffic keywords, and helpful keyword traffic estimates. Typically used in conjunction with GoogleAds. Email Hippo is an email address verification program to help you weed out bad addresses, reduce bounce rates, and help make sure the time you spend doing marketing emails is worth it. You can clean up a whole list with a quick upload or just check addresses one at a time as you input them. Litmus is an email testing and analytics tool with cross-device community templates to use anywhere. Typeform is a mobile-friendly survey provider with fast deployment and 100 responses per month for free. Typeform’s advantage is their focus on mobile-first, allowing you to create simple mobile forms, thus increasing response rates. With Wild Apricot, you can instantly set up a member database that collects contact info from online forms (new member forms, event registration, etc.). Then analyse, search, filter, group, and communicate with your members with a built-in email/newsletter system. Canva is a social media and desktop publishing content generator with drag-and-drop features and professional layouts to help nonprofits easily design professional graphics and documents. Nonprofits are allowed 10 free users. Easily is an easy inforgraphic and chart making tool with 1,000's of templates to choose from. Noun Project is a quick and easy way to find useful icons. The site is free with attribution and there is a nominal cost for licensing. Palettable is a color palette development. Simply insert one color and it will suggest additional colors that may work well as a compliment. Piktochart is an easy-to-use, drag-and-drop infographic design tool to produce hi-resolution graphics and PDF exports. They also offer a nonprofits a significant discount, which you can find here. PikWizard is a stock photography website that boasts over 30,000 images, completely free. What's better is that you can edit your selected photo on the spot with text and image effects, then publish it to your blog or social media. Unsplash is a provider of free high-quality stock images. Wistia is a video hosting and analytics platform to help organizations upload, host and share videos quickly with no ads or third party related videos. Like a private channel, organizations can can integrate a call to action, in-depth analytics, and/or request that a person enter their email address to show or continue viewing the video, which can be a great lead-generating platform. An easy way to track fundraising efforts and donations. DonorPerfect collects all your funds in one easy system that can generate instant reports. An accounting suite, FreshBooks automates the creation of invoices and helps you track expenses easily. Save time and boost participation with free and easy volunteer calendars, online scheduling and automated reminders. You'll love Signup.com's custom templates, e-calendar sync and simple mobile sign-ups. Premium members can add assistant admins, upload waivers, track service hours and more. If your organization runs on membership dues and event fees, Wild Apricot is a great nonprofit software that can save you hours each week by automating all your administrative tasks, like processing payments, communicating with members, and sending invoices. Don’t let your to-do list get any longer. Wunderlist is a great list management tool to help you manage all your projects and update team members on their tasks. x.ai is an online personal assistant that can help with scheduling meetings and reducing attendee conflicts. Asana is a project and work management tool relied upon by nonprofits as varied as Possible Health and the Malala Fund. The software provides a place for teams to organize and manage everything from planning to execution, and integrates with Slack and document-sharing services like Box and Dropbox. AskWonder connects you with a team of actual researchers you can assign for research projects. ClickTime makes it easy to track employee time against the programs and grants you manage. Thousands of organizations use ClickTime to ensure compliance, improve program management, and drive increased funding. FancyHands connects you with a team of actual people, in real life, who you can task to take care of small admin-like tasks such as making reservations, scheduling appointments, finding travel options, and searching for contact information. Google provides nonprofit organizations with a suite of tools including Google Apps, free domain linked email addresses, free credits with Google Adwords, and much more. How many of these tools will require a password and new account? All of them. Don’t go without LastPass, a cloud password management tool. mightytext is a desktop version of your Android text messaging app, so you can communicate more quickly and save battery life. Microsoft provides nonprofit licenses for email and online application usage for nonprofits using PCs. Paymo is a task management, time tracking and invoicing software that allows you to manage small or large projects whether you're an individual or a team. Paymo is free for one year for schools, colleges and universities, plus they have a 50% discount for nonprofit organizations. Slack is a cross-platform messaging and team workspace to help you keep track of tasks without loads of back and forth on email or sitting through tedious meetings. Slack is free for nonprofits and great for internal communications. Todoist is a simple yet powerful to-do list app that helps people get organized and achieve peace-of-mind, from planning large scale projects to simply remembering to pay the rent. Non-profit organizations are eligible for a 50% discount. From the creators of Todoist, Twist is a team communication app designed to challenge group chat apps like Slack. Based on threads, it fosters mindful, asynchronous communication and gives teams a central place to have organized, on-topic conversations that are accessible to everyone. Like Todoist, Non-profit organizations are eligible for a 50% discount. Vidhub is an online, distraction-free video review and discussion program good for video creation and editing as well as onboarding or training team members. Bitly lets you easily shorten any URL and track how many clicks it gets. Bitly's basic features are free. Buffer gives you a social media dashboard that allows you to schedule posts, post across channels, and curate your content. Buffer’s analytics suite adds to the ability to track social impact in real time. Buffer also offers a 50% discount to nonprofits, see here for details. Lattergramme is an Instagram scheduling tool that enables social media managers to format and schedule Instagram posts in a desktop app and then sends notifications to their smartphone for seamless posting. MeetEdgar is a social queue automation tool, allowing you to upload your social editorial content quickly and easily for future broadcast. Quuu is a content curation tool for social media, a bit like having an automated social media intern (but like a real intern, Quuu needs monitoring to keep the social feed on message). RiteTag is a real-time hashtag performance tool that helps you track your hashtags and keep up on trends in both Instagram and Twitter. Cloudflare is an easy to implement content delivery network, with lots of options for free. BuiltWith is a tool that gives visitors an inside look at how other organizations are using technology on their websites, which is very helpful if you find features you love and want to integrate into your own website. This is a site speed tool with insights on how to make your website more mobile friendly. An easy WordPress management program with automated back-ups, ManageWP creates website clones and deploys development sites to ensure your main site isn’t compromised during upgrades and changes. ManageWP isn’t free, but it can be invaluable when doing WordPress upgrades. PDFsam is an open source software that allows you to split, merge and rotate PDF files. It's perfect for when you need to combine multiple PDF files for a grant application. An open-source digital asset management platform, ResourcesSpace allows you to upload all of your organization’s images and videos so they can be managed in a comprehensive system. Google encourages businesses and nonprofits to provide additional information to help your nonprofit higher on Google search results. Google My Business includes mapping your location, a list of your hours of operation, your contact information, and a link to your website. You can also add your logo and images of your organization once you claim your page, improving your SEO results overall. For nonprofit organizations where physical location is central to service delivery, ensure Google Street View has a solid 360 degree photo of your organization and your updated contact information. Launchaco is somewhat of a naming tool, displaying available domain URLs and social media account names, to help you pick something unique and available across platforms. SUMO is an automated website growth software that can help your organization find more customers or get more shares on social media. It does this by inserting an additional bar or splash screen on your website to direct traffic or highlight a special event. Heat maps are bundled with their service and allow you to clearly see what visitors to the website site are clicking to optimize your flow of traffic and get more hits on your calls to action. I would love to say that this is an exhaustive list, but new nonprofit software is launched every day. And for more information on the tech tools in this list, check out our Wild Apricot webinar about nonprofit time-saving tech tools, where three top tech experts dive into more detail on each of these tools and how they can benefit your nonprofit affordably and easily.